No history of Ashland is complete without the story of the Ashland Springs Hotel, one of the most prominent landmarks of Southern Oregon, and the most prominent building in Ashland for the past 90 years. The landmark Ashland Springs Hotel stands where, in the 1850s, seekers of gold passed on their way to a gold strike in nearby Jacksonville and where, later, covered wagons traveled an emigrant road. Still later, in the late 19th and early 20th centuries, the area’s mineral springs and the popular Chautauqua series of lectures and entertainment attracted visitors. Now, in the 21st century, tourism and the Oregon Shakespeare Festival draw thousands of theater lovers and recreation enthusiasts to Ashland. Photos 1,3,4 courtesy of the George Kramer Collection. At the heart of these activities for the past 90 years has been this magnificent hotel in the center of town. 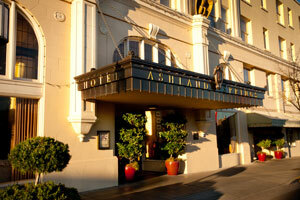 The historic Ashland Springs Hotel is a nine-story hotel built in 1925 as the Lithia Springs Hotel. 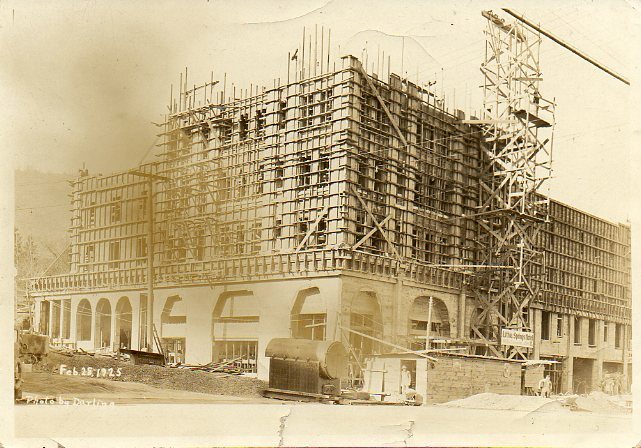 Tourism in the scenic Rogue Valley was increasing in the 1920s and promoters dreamed of a luxury hotel that would compare favorably with the fashionable hotels back East. 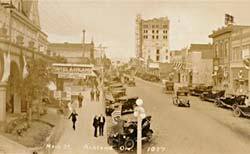 On July 1, 1925, the 100-room hotel opened with an elegant dinner for 500 guests from all over Oregon and Northern California. “Luxurious, elegant, splendid,” people said of this impressive hotel whose architecture is a hybrid of gothic and beaux-arts architecture. The Lithia Springs Hotel was the pride of the community, the tallest building between Portland and San Francisco, and as the southernmost city in Oregon, on the slope of the Siskiyou Mountains, a natural stopping place for visitors traveling from the Northwest to California or from California to the Northwest. The hotel was a welcome retreat for travelers and visitors who came to hear the Chautauqua lectures, to enjoy nature’s abundance, breathe the healthful ozone of this mountain foothill city or drink, bathe and partake in the marvels of the famous Lithia Springs water, which was said to be the purest and most healthful in America. The 1925 hotel was beautifully furnished throughout. It had, and still has, a beautiful light-filled two-story lobby with a grand fireplace, spectacular terrazzo floor and a comfortable mezzanine. Many of the rooms were furnished with twin beds, 80 percent of the rooms had private baths and each had a panoramic view of the scenic valley. The hotel boasted a dining room and ballroom. Catering to both commercial and tourist travelers, the new hotel lent an atmosphere of home to the traveling public. Over the next 70 years, difficult times visited the beautiful hotel. Various owners and economic downturns created more hardship than happiness for the hotel, and the hotel suffered. It was in 1960 that the Lithia Springs Hotel, also known as the Lithia Hotel, became The Mark Antony and an English Tudor theme was introduced to tie into the growing Oregon Shakespeare Festival. The number of rooms was reduced and refurbished. A swimming pool was built (recently replaced with a walled garden courtyard) and the ballroom expanded. By 1997 the once proud and elegant hotel was again closed and abandoned. The original furniture had been auctioned off and the hotel was in desperate need of complete restoration and revitalization. A near miracle would have to transpire to resurrect this historic property with such glorious bones. In 1998 Doug and Becky Neuman purchased “The Mark” and started a complete basement-to-parapet remodel of the hotel. Their vision was to restore the hotel to its original grandeur. It would take a special team to make this vision a reality. Candra Scott and Richard Anderson of Candra Scott and Anderson, who specialize in historic restorations, were asked to create the interiors for the hotel. WestCoast Hospitality was hired as the management team. 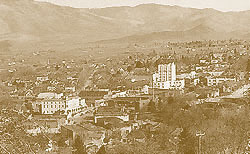 The now 70-room hotel was to be called the Ashland Springs Hotel. State-of-the-art systems were installed, including mechanical, electrical, heating and air conditioning. High speed internet service was linked in. A sophisticated music system was brought into all the public areas. Fire and safety features were installed and a service elevator was added to ensure efficient banquet service. A conservatory was built onto the ballroom with glass doors that open onto a walled courtyardwith a gazebo, fountain and garden. The building’s facade was refurbished and repainted and the windows preserved, including the original stained glass bearing the LH crest, which is over the front entrance. Six original chandeliers light the ballroom and the lobby restroom’s original pedestal sinks were refinished and reset. The original bathrooms in the rooms were gutted and redesigned. Interiors were created to evoke a more simple era back to those times of “water cures” and the draw of nature. One-of-a-kind pieces of furniture for the lobby were chosen for their natural beauty and emphasis on comfort. Various collections displayed in the lobby bring nature’s wonders inside, as do the framed turn-of-the-century herbs in the rooms. Rooms offer crisp white linens, French-style quilts, goose down blankets and lavender bath teabags/sachets. Tremendous attention to detail has been given to every room and to every aspect of the hotel.